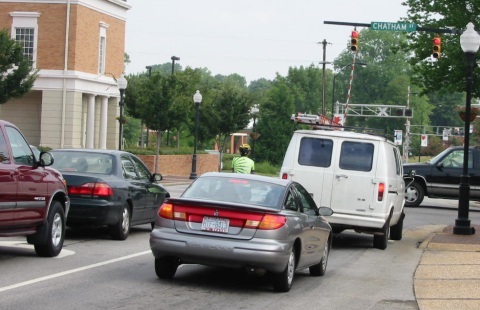 Whether you’re commuting to work, cycling through the countryside or just trying to get to your favorite greenway, you’ll inevitably encounter traffic. The right skills and knowledge can make traffic negotiation on a bicycle easier, safer, and less stressful. This guide covers the fundamentals of successful bicycling in traffic. 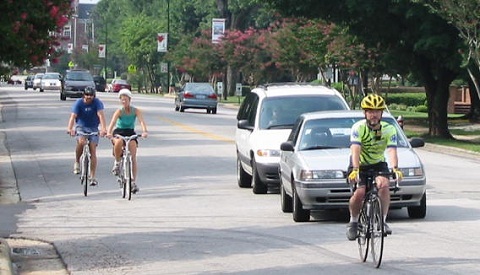 To learn more, we recommend attending a hands-on Cycling Savvy or BikeWalk NC Traffic Bicycling class. For traffic strategies specific to group bicycling see our Group Bicycling Skills and Techniques guide. However, two-wheeled vehicles are narrower than cars. This compels bicycle operators to pay more attention to their visibility and position in travel lanes in order for their movements to be predictable to other road users. Also, bicyclists often travel slower than other traffic, which means cyclists must be aware of when and where other traffic may be overtaking, and sometimes take steps to manage that overtaking. This guide provides real-world examples to illustrate how cyclists can employ safe, legal and effective defensive bicycle driving techniques to optimize their safety, efficiency and courtesy when negotiating traffic. Use the tabs at the edge of this page to navigate to each topic. Faster drivers must yield to slower and stopped traffic ahead. All vehicle operators must travel no faster than is safe and will allow them to stop within their sight distance. This legal principle is known as assured clear distance ahead. 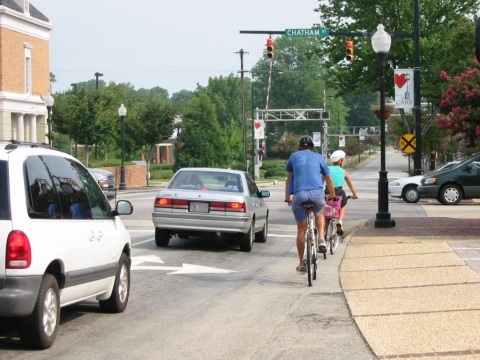 As a bicyclist, you have a right to use the roadway, and other drivers are legally required to respect your right of way, but you must act visibly and predictably to allow them to do so. Each driver who is already on the road is entitled to the space their vehicle occupies, plus reasonable clearance behind and to each side, and reasonable stopping distance in front of them. Drivers must yield to other drivers already on the road in front of them, which requires them to limit their speed and be prepared to slow or stop for other traffic ahead. § 20-141. Speed restrictions. (a) No person shall drive a vehicle on a highway or in a public vehicular area at a speed greater than is reasonable and prudent under the conditions then existing. … (m) The fact that the speed of a vehicle is lower than the foregoing limits shall not relieve the operator of a vehicle from the duty to decrease speed as may be necessary to avoid colliding with any person, vehicle or other conveyance on or entering the highway, and to avoid injury to any person or property. § 20-140. Reckless driving. (b) Any person who drives any vehicle upon a highway or any public vehicular area without due caution and circumspection and at a speed or in a manner so as to endanger or be likely to endanger any person or property shall be guilty of reckless driving. Most drivers have no difficulty limiting their speed and seeing and slowing in time to avoid hitting vehicles traveling slowly ahead on the roadway. Impaired driving, reckless driving, distracted driving and bicycling at night without an adequate rear light or reflector are the primary contributing factors in car-bike collisions where motorists fail to slow in time to avoid rear-ending slower bicyclists. Fortunately, there's a lot you can do to improve the reliability with which drivers see and yield to you. Always use front and rear lights when cycling at night, and be sure to take advantage of the conspicuous lane positioning techniques described later in this guide. Driving your bicycle on the right half of the road (§ 20-146) prevents head-on collisions and avoids surprising other drivers at junctions. Wrong-way bicycling is many times more dangerous than right-side bicycling, and is a leading cause of car-bike crashes. About 1/3 of bicycle-automobile collisions involve a bicyclist traveling on the left half of the road or otherwise opposite the expected direction of vehicle traffic. Right-turning drivers scan for vehicle traffic coming from their left, and often turn directly into the paths of wrong-way cyclists. Drivers are often surprised by the presence wrong-way cyclists, and neither party may be able to stop in time to avoid a crash. The impact speed equals the car’s speed plus the cyclist’s speed. Never drive a vehicle against traffic. RIDE RIGHT. Drivers entering or crossing a roadway must yield to the traffic that has priority (see § 20-158). Stopping improves the reliability of the yield by increasing the amount of time that the driver has to see and recognize approaching traffic while in a position of superior vantage. The most common types of bicycle-motor vehicle collisions are junction crashes are where (1) a bicyclist (usually a child bicyclist) rides out in front of a through-motorist from a driveway or side street, or (2) a motorist drives out in front of a through-bicyclist (often a bicyclist on a sidewalk). Riding in a visible, conspicuous location where other drivers are looking for traffic reduces the risk of such collisions. 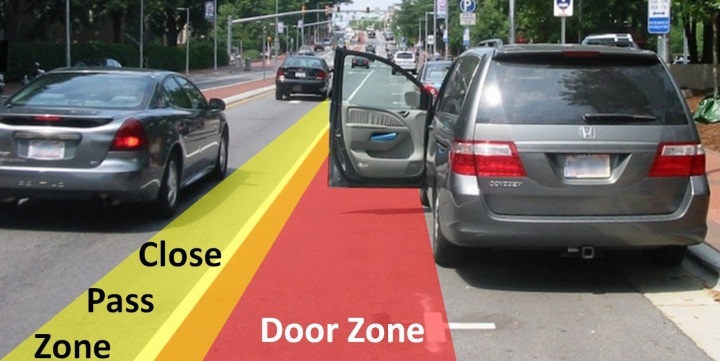 Riding farther into the travel lane, as shown below, makes a bicyclist more likely to be seen, and provides more time and space to react should a driver begin to pull out into the roadway. 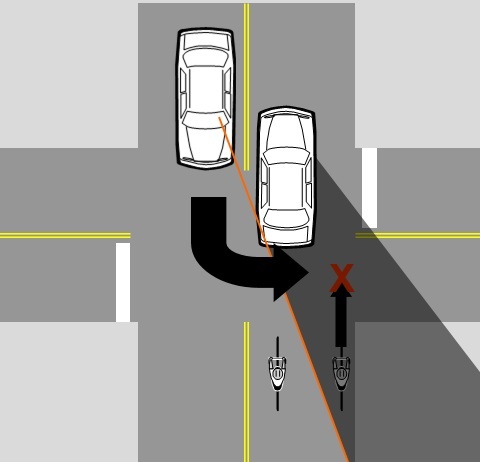 Another common type of car-bike collision is a left-cross collision, where an oncoming driver turns left in front of the bicyclist. 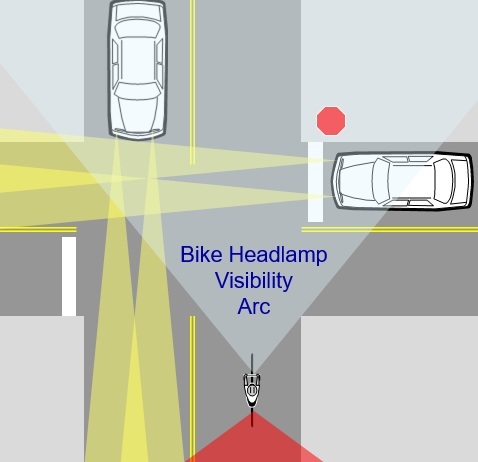 Riding at the right edge of the road can result in the bicyclist being screened from the oncoming driver, while riding farther left in the lane provides better visibility, as shown below. A bicyclist must move laterally on the road when preparing for turns, when moving to a visible lane position or when avoiding hazards. It’s essential to LOOK BACK and to the side before any lateral movement in order to yield properly and avoid violating the right of way of other road users (§ 20-146 (d)(1)). Doing so without swerving requires some practice, but is easy to learn. To practice the LOOK BACK, ride on a straight line or marking in an empty parking lot or deserted road. Try to keep your tires on the line as you turn your head and twist your shoulders around and then straight. Be sure to practice turning in both directions for both leftward and rightward lateral movements. Start with both hands on the handlebars, then try combining the LOOK BACK with hand signals. Hand signals can help you communicate your intentions, but make sure you don’t sacrifice control of your bike.Remember not to leave your head turned too long, because conditions in front of you can change fast. 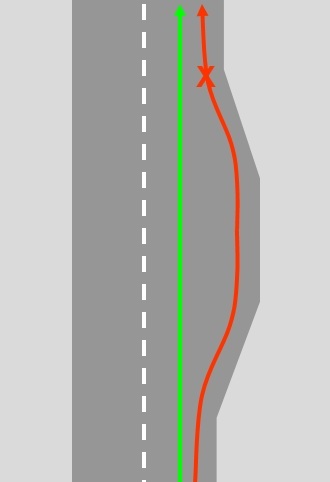 If a sufficient gap in traffic does not appear right away when you need to merge laterally, make a hand signal and look at the driver operating behind the space you’d like to merge into. The driver will often see your signal and let you in. If not, try the next driver behind the first one, and so on. Eventually someone will let you merge. In some situations traffic is just too dense or too fast for this to work exactly when you want it to. Merging sooner, when a large gap is available, rather than later, when you need to be in position already, can make this easier. 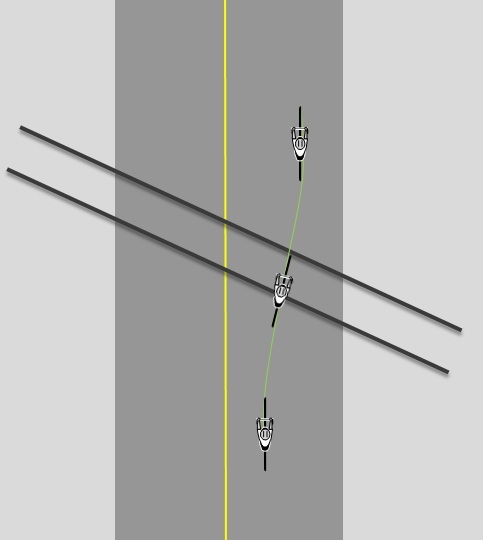 Merging very early may puzzle some drivers who aren’t used to seeing cyclists operate away from the curb, but it makes you easier to predict and is much safer than trying to merge too late. Don't mindlessly follow the right edge of the road when the usable lane width fluctuates. This can lead you into a conflict an overtaking vehicle when the space narrows. Ride in a reasonably straight line, providing yourself enough usable pavement to maneuver safely. If you want to help other drivers pass by moving right where the pavement widens, be prepared to slow down and wait before you merge back into the path of traffic. Drivers approach intersections using a lateral position that corresponds to their destination (see § 20-153). Left turning drivers approach in a position near the center of the road. Right turning drivers approach from a position near the right edge of the road. Straight traveling drivers choose a position between these extremes. Separate lanes are often designated for these destinations; in other cases, bicyclists operating narrow vehicles must be aware of their position within a single wide lane. 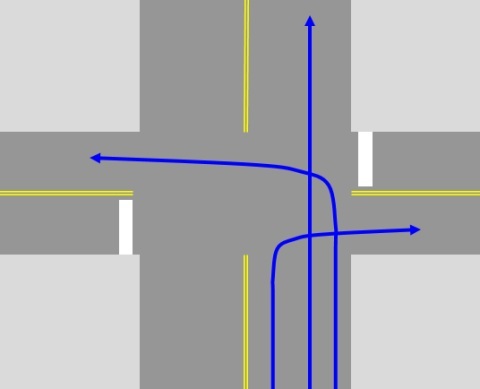 Attempting to negotiate and intersection from the wrong position results in path conflicts, as shown below. This sometimes happen when drivers select a lateral position based on vehicle type rather than according to destination. 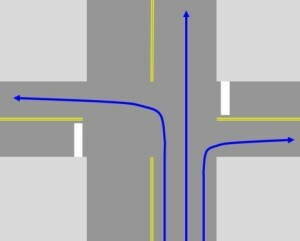 When preparing to turn left, move laterally and approach the center line or use a left turn lane where available. When preparing to turn right, approach the rightmost side of the roadway or use a right-turn-only lane. When proceeding straight, stay out of right-turn-only lanes and use the thru-lane instead. When traffic queues at a traffic signal or intersection, get in line with the other traffic; don't try to squeeze past on the right. Getting in line makes you more visible and predictable, deters right-hook collisions, and avoids making drivers pass you multiple times. The cyclists shown below are about to go straight through this intersection, but they decided to pass other drivers on the right and then move onto the sidewalk. This makes them vulnerable to right-turning traffic and forces them to yield to or merge with straight traffic in the middle of the intersection before entering the narrow travel lane straight ahead. Passing traffic on the right without being in a separate travel lane is prohibited in North Carolina. Passing or stopping on the right side of large trucks is especially dangerous, because the trailer will swing sideways and track to the inside of the turn, knocking a bicyclist over and running them over with the rear wheels. Most truck drivers cannot see bicyclists on the right side of the truck due to a large blind spot, and they don't usually expect traffic to overtake there. Never pass on the right side of large trucks that might turn right. Some roads feature marked travel lanes that are wide enough for motorists to pass cyclists at a safe distance within the same lane lane. 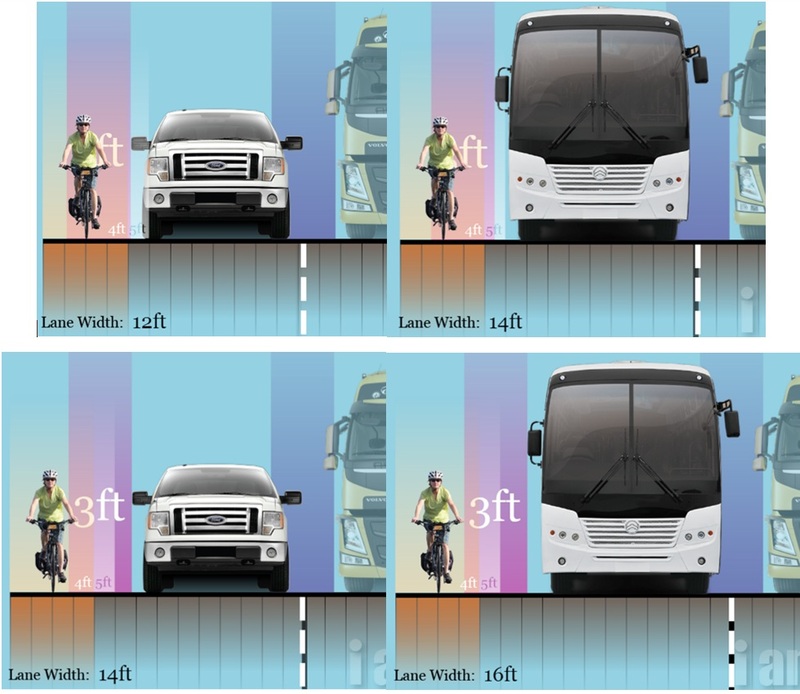 This requires at least 14 feet of usable pavement for passing by an SUV, and at least 16 feet for passing by a truck or bus. Bicyclists may sometimes ride far enough right to facilitate same-lane passing as a courtesy on such roads. 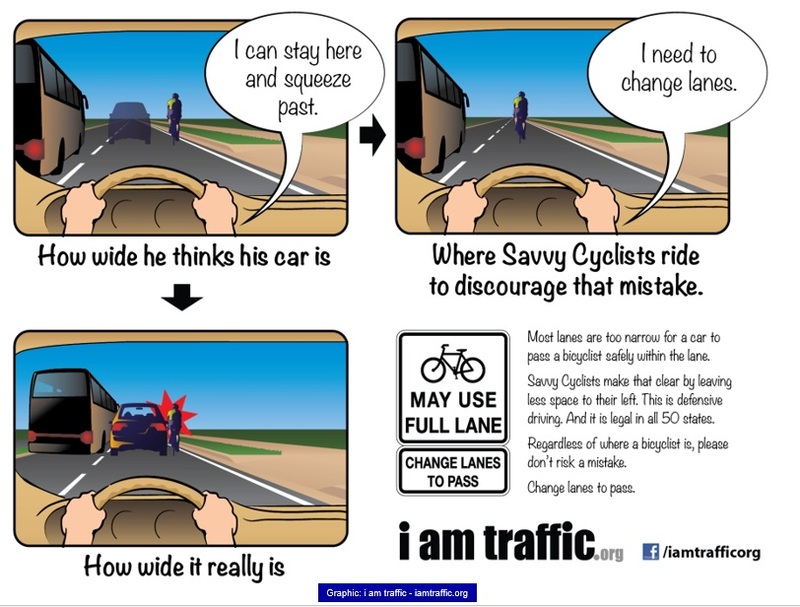 However, most travel lanes are only 10-12 feet wide, too narrow for safe same-lane passing, as shown below. In typical, narrow travel lanes, riding at the right edge encourages drivers to attempt passing within the same lane. Drivers may misjudge conditions and not realize how narrow the available space is until it's too late, especially when they are approaching at high speed. 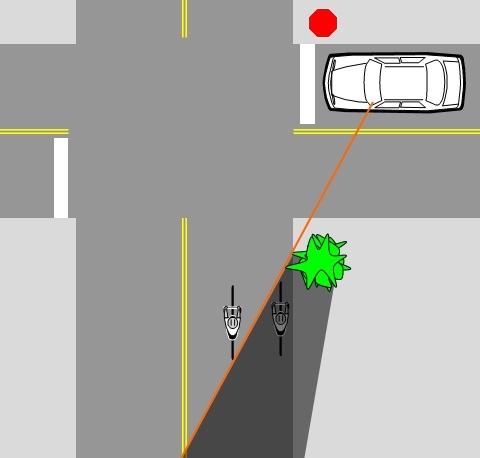 The most common type of car-overtaking-bicyclist crash involves a driver who sees the bicyclist riding at the right edge of a narrow lane with plenty of advance notice, but attempts to squeeze within the same by at high speed. In a narrow travel lane, it’s usually safer for the cyclist to ride far enough into the lane to make it clear to motorists that they must move into the adjacent lane to pass. 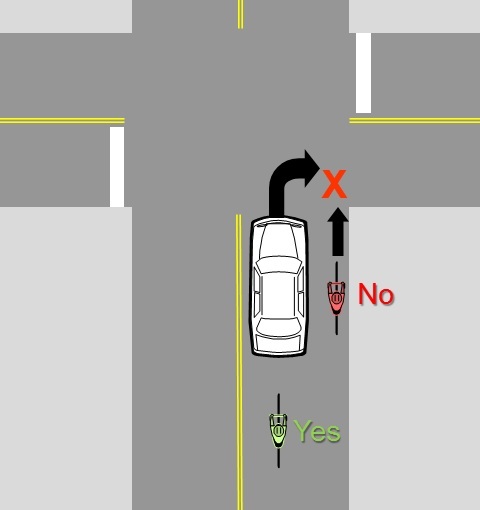 When it becomes safe to pass, a bicyclist can encourage a following driver to pass by moving to the right, a technique called "control and release" [see this video]. 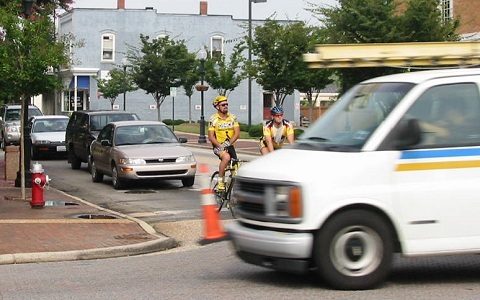 If other traffic backs up for a long time without a safe opportunity to pass, a courteous cyclist can look for a place to stop and pull off the roadway to help it disperse. On urban streets with on-street parking, the center of the right hand travel lane is the safest default position for bicycling. Drivers can usually pass using the adjacent lane with minimal delay. If road and traffic conditions prevent this, and traffic backs up for an uncomfortably long time, you can look for a safe place to pull over and let those drivers pass you as a courtesy. This is much safer than riding at the right edge under narrow conditions that invite squeeze-by passing. Wide paved shoulders and bike lanes vary in quality and surface condition. If wide and clean, they can facilitate passing by motor traffic. Avoid riding on edge pavement that features debris or other hazards that may force you to make sudden merges into the adjacent lane. Avoid using right-edge bike lanes and shoulders to pass on the right side of traffic that is likely to turn right; this can result in right-hook collisions. It is safer to get in line with the traffic queue.